I have a secret! Woman, come closer, read this and be sure to hide this because I’m going to let the cat out of the bag! This could be the answers to all your problems. First you must answer this; do you wish your Husband would do the dishes? Maybe do some laundry? How about not be upset with you because you bought an expensive dress? Or maybe you forgot to pay the utility bill? I know you know what I am talking about. Here is the answer to all of your problems. Yes Steak! A big 1 pound ribeye steak! This solved so many issues! I got my Husband to do work in my kitchen and I need more, so guess what I’ll be making again? Steak!!! One thing that puts the biggest smile on my Husbands face is a steak served with mashed potatoes!! This is the secret weapon to solve all household problems!! But it’s just not steak, it’s a fantastic, wonderful, delicious marinade that made an ordinary steak, spectacular!! This is Liz’s, from That Skinny Chick Can Bake Soy, Orange Juice and Red Wine Marinade. This is one of the easiest marinades I have ever made and it made the steak so tender that it melted like butter in your mouth. 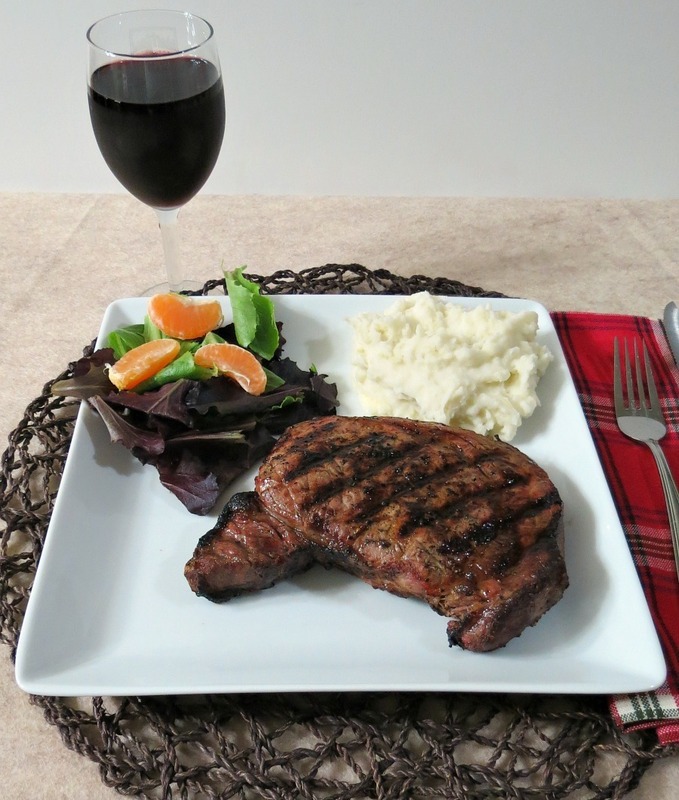 A savory, most tender ribeye steak marinated in orange juice, soy sauce and red wine. Mix orange juice, soy and red wine in a zip lock bag. Place steak into marinade. Seal bag and marinate overnight or at least 4 hours in refrigerator. Turn grill to high heat, place the ribeye steaks on the hottest part of the grill. At this point, you are going to see a flare up. This is where the fat is dripping onto the fire. If the flame doesn't go away in a few seconds, simply use your tongs to slide the steaks away from the open flame until the flame dies down and then move then back over the heat. Continue to grill with the lid open for about 4 – 6 minutes. Flip the steaks over onto the other side, still over the hottest part of the grill and grill an additional 4 – 6 minutes, for a medium-rare delicious steak. Remove the steaks from the grill and allow to rest for 5 minutes before serving. 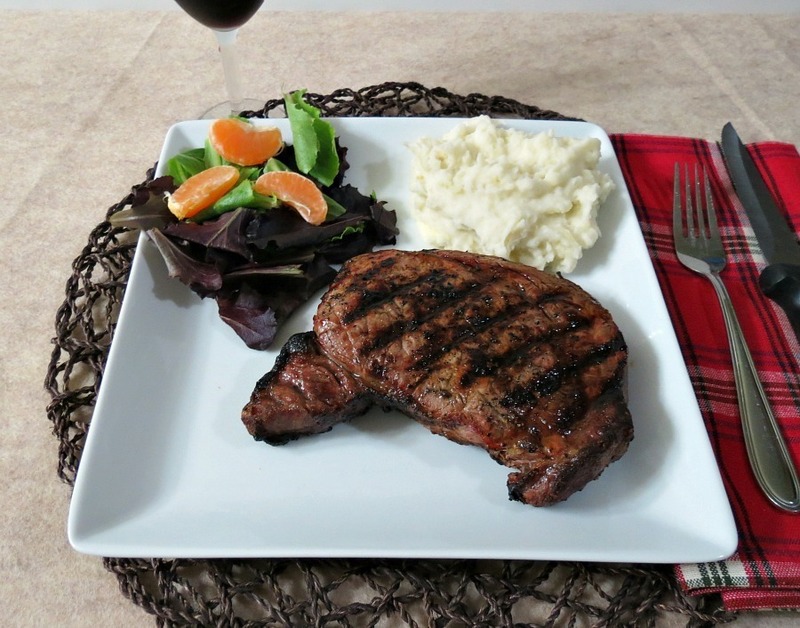 The resting period is important so that the juices don’t run out when you cut into the steak. Have a great day and be sure to check out everyone’s recipes from the #SundaySupper! Oh, I am THRILLED you enjoyed this marinade, Jen!!! I need to try it on rib eyes (my hubby’s fave!). Happy Sunda Supper to you!!! Thank you for the recipe and all of your wonderful recipes!!! I will be using this marinade for years to come!! Ok, I am so jealous! I need to get my Hubby to do the dishes more! I LOVE this post Jennifer! This sooo sounds like my husband. Give him a steak and he is the happiest guy on the planet. Looks juicy and scrumptious! Men are funny when it comes to there meat!! I’m sure my husband would like this…but I think I’d love it just as much. It looks delicious! I loved it too!! But him, my gosh, it made him so happy!! I bet he would! My Husband couldn’t stop smiling! Isn’t it amazing how the simplest things can have such a big effect? I would gobble this down in a heartbeat! Yes, I love simple and tasty!! Yeah…my husband is a fiend for ribeye too! But…it’s never made him do the dishes. Maybe this marinade would do the trick! Try it, you never know! Maybe it’s not the steak that is the secret, it could be the marinade?? Look at the beautiful hunka hunka lovely meat. Looks so delicious and what an easy marinade!! lol!! Love the marinade! Glad Liz posted it! The marinade sounds delicious! And I am all for grilling year round, no matter how cold it is! Me too! I love grilled foods!! Can’t go wrong with Steak at my house either lol. This looks like a great way to add flavor to meat. Yum!! Thanks for sharing. Love this marinade! So perfect! can’t wait to try it with other meats! I could be bought off with this steak. Just sayin’! Love how easy and simple this is and looks absolutely delicious!!Yumm…. Thank you! I love how simple it is too! It took like two minutes to put the marinade together! I love that! Love the simplicity and flavors of this marinade definitely going to try next time I grill. Oh you should! The marinade is amazing and so simple! Jennifer, this sounds wonderful and quite magical too! Jennifer~ You get the award for the funniest #SundaySupper post! I looooooove it! So glad you join us… your recipes, your blog and YOU fit right in! I’m glad I joined the group! I’m having so much fun! What a great group of bloggers!! You can get me to do the laundry too. This is an amazing recipe! This has been on my to make list since Liz posted it. Gosh I’m rediscovering so many good recipes this week. I don’t even know where to start. There were a ton of great recipes this week!! There are so many I bookmarked to make. Liz’s marinade is perfect! Made the meat so tender, it really did melt like butter when you took a bite! HOLY COW. (no pun intended) that steak looks PHENOMENAL. seriously! I hate doing dishes and even I would bust out the sponge for that gorgeous piece of beef! And this marinade just sounds glorious. ohhh golly. I actually tried that marinade for chicken, but didn’t even thing about steak! Looks so good! Ohhh, I bet it was good on chicken! That marinade sounds tasty! I’m always looking for new marinades! I’m always looking for marinade too! I like how easy this is. Well this marinade sounds like it could get even ME to do the dishes!!! That looks like the best steak ever! My husband does the actual grilling but I will definitely try the marinade the next time. Yum! I wish my Husband would grill, but I do that too!! Your lucky!! Haha I’m pretty sure The.Boy. would marry me on the spot if I made him steak. 😛 It really is the key to a boy’s heart! I actually have all the ingredients for this (well, the steak is in the freezer). Anyway, a little thawing and marinating and then I can’t wait to hopefully see the same smile on my husband’s face when I make this for him. He will love it!!! A man and his steak!! Love of simple men can be when it comes to steak!! Thanks! It was a hit here!! lol!! Yes steak always wins in my house! Oh thank you thank you thank you!! This is getting pinned and put in my arsenal!! Rib eyes are my guys favorite thing but he always grills them. I would love to be able to whip these babies out!! The marinade is wonderful and my Husband loved it on his Ribeye. It’s his favorite steak too! I’m going to have to try this method. I have pile of laundry calling my name that I’m too lazy to touch. This steak looks amazing! I hate doing laundry, it’s so time consuming!! I swear the load never goes down!! I have to bribe my Husband some how and steak is the way to do it! lol The marinade is wonderful, I love how simple it is! You are hilarious!!! I love this post .. so true! Throw a piece of meat at a man and he’ll do anything! 🙂 your steak looks amazing. will definitely have to try this marinade! Ok, second time seeing this recipe and as equally intrigued…NOW, I gotta try this! lol, if you try it let me know what you think! 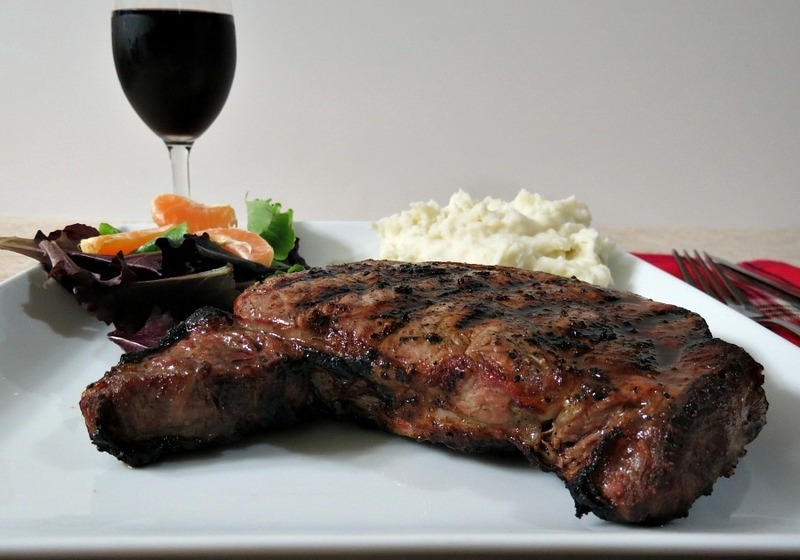 Trust me, I will buy your idea….cook more delicious food and get them to clean the kitchen:D This steak looks so good and will be added in my trial list. Trust me, I’ll buy your idea….create more good food and get them clean up the whole kitchen 😀 This steak looks so good and am going to add in my trial list! Thank you! My Husband already asked when I’m making it again.